We are always seeking ways to treat and cure our ailments these days and our understanding and awareness of crystals and their healing powers have flourished. In fact, you may have noticed that something magical happens when we use crystals as part of our healing process. These crystal therapy courses will take you on a journey of self-discovery and self-healing as we explore crystal intelligence and how crystals synchronize with the seven chakras for healing and clearing of energy fields. The laying-on of stones can be a very powerful component on one’s healing process and to the universal knowledge available to all of us. In crystal therapy, a client’s growth and health is influenced by the energy of the crystals. Crystals contain their own natural vibrational rate, which is constant, unlike our vibrational rate (our physical, emotional and mental energy fields) which is subject to fluctuations due to stress, emotions or illness. The use of crystals can help our vibrational rate remain steady, and even become stronger, so that health, vitality and physical, emotional, mental and spiritual well-being can be achieved. Like everything in the Universe, crystals vibrate. 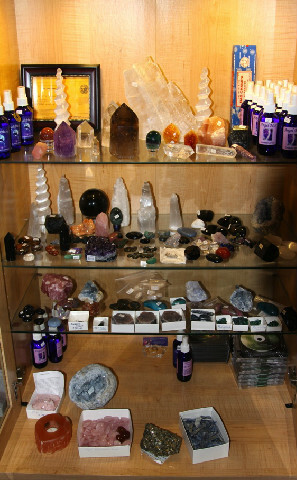 We know that crystals focus, transmit, transmute and store energy. Crystals can give us the boost that we need. This can be accomplished with crystal layouts, in which small stones are placed on or around the body in a healing session, with the appropriate placement of stones in one’s environment. These courses in crystals have been written with the aim of ensuring that the individual develops his/her own healing potential by gaining a thorough understanding of the energies of crystals and their physical and metaphysical properties. These courses are also designed to accelerate your spiritual growth and personal development. The first Crystal Therapy Course is an in-depth class creating a foundational basis for harnessing the true power of crystals and their healing abilities. Pre-requisite to taking this class is that you must have a level One Crystal Therapy Certificate. There will be an hour for lunch and several breaks.